Samira Abdi, 13, has spent her whole life in Regent Park. With a front row seat to the revitalization of the east Toronto neighbourhood, the Grade 8 student has seen countless changes over the years. She's literally watched the condo towers rise around her. But the downside of shiny and new is it becomes harder to remember what was there before. “It has taken memories away because I'm forgetting what was there,” Abdi says. For the past few months, Abdi has been working with University of Toronto students to preserve her memories of the neighbourhood, while looking to inform new residents of Regent Park’s history. They’ve created an interactive timeline of Abdi’s life that coincides with major developments during the Regent Park revitalization project. “We're looking at her experiences – of losing the landmarks in her life that have been around and the way her and her family and friends have been navigating the new landscape of Regent Park during and after revitalization,” says Sayem Khan, an urban studies and human geography student. This project is part of a collaborative course between U of T’s urban studies department and Regent Park Focus, a non-profit community organization that seeks to counter negative stereotypes about the neighbourhood. The course is funded by U of T’s School of Cities and the Centre for Community Partnerships. 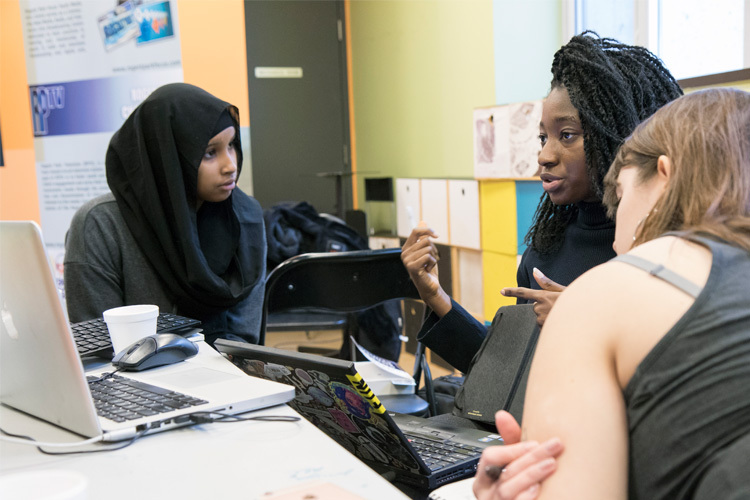 U of T students are paired with teen girls from Regent Park Focus’s Diva Girls Group – a program for young women in the neighbourhood who meet weekly to participate in media-focused activities. Each group is working on a different media project – from a zine full of social commentary to a podcast about the relationship between policing and rap culture. The projects will culminate in a public multimedia exhibition on April 8 at the Pam McConnell Aquatic Centre. The U of T course, Youth, Art and Engagement in Cities, is taught by Aditi Mehta, an assistant professor, teaching stream, who came to U of T last year after completing her PhD at Massachusetts Institute of Technology. In Mehta’s previous research, she worked closely with youth media organizations and knew she wanted to centre her urban studies course on a similar kind of collaboration. “I knew that I wanted to teach a community-engaged course,” she says. Throughout the semester, the U of T students have been reading academic writings on Regent Park’s redevelopment – gaining an understanding of the successes and challenges that came along with the community’s transformation, while learning about the stereotypes that are perpetuated through news articles about the neighbourhood. “What we saw in articles about Regent Park and that perspective was very, very different from what the people in this community and, specifically, what the Diva Girls think in particular,” says urban studies student Esi Aboagye. The large-scale Regent Park redevelopment was initiated in the early 2000s to combat isolation, poverty and crime in the neighbourhood, which was largely populated by public housing complexes. When the construction began, many of the existing residents were forced to relocate – with a promise that there would be housing for them in the new residential buildings. While most households have returned to the neighbourhood, some are still waiting to come back. There are still three phases of construction left to go – which could take more than a decade to complete. The U of T students have gained a whole new perspective on the neighbourhood through the teens. That includes an understanding of how concepts like socially-mixed housing and redevelopment play out in the real world, says Mehta. “There's been a lot of education and knowledge shared,” she says. 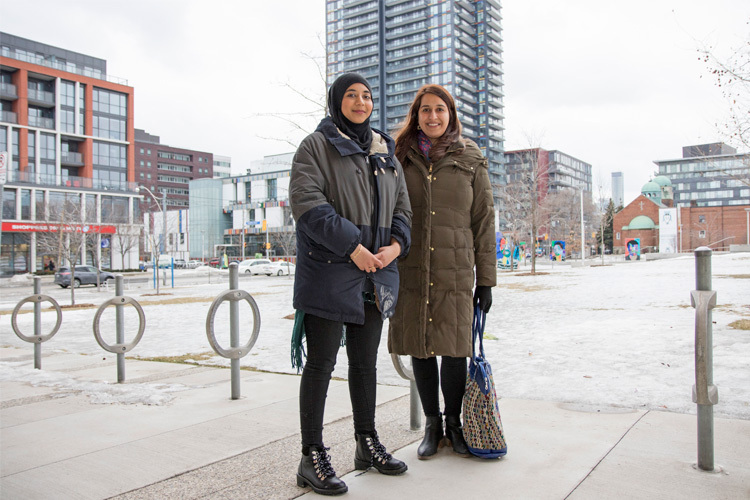 Growing up in a neighbourhood in flux, the Diva Girls are aware – and vocal – about the issues facing Regent Park, and ways to make the community more equitable, says Amna Quaid Azam, who co-ordinates the program. Quaid Azam says she was surprised about how knowledgeable the teens were when she first started working with Diva Girls. “They are very woke. I didn't expect them to be this woke,” she says. Sumeya Ali, 15, says she hopes the media projects the course produces help people think differently about Regent Park.